This class defines the infinite cylindrical surface. Every cylindrical surface is set by the following equation: S(U,V) = Location + R*cos(U)*XAxis + R*sin(U)*YAxis + V*ZAxis, where R is cylinder radius. 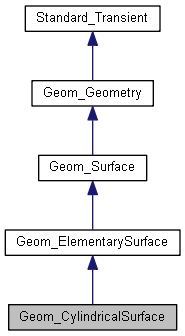 The local coordinate system of the CylindricalSurface is defined with an axis placement (see class ElementarySurface). The "ZAxis" is the symmetry axis of the CylindricalSurface, it gives the direction of increasing parametric value V.
The "XAxis" and the "YAxis" define the placement plane of the surface (Z = 0, and parametric value V = 0) perpendicular to the symmetry axis. The "XAxis" defines the origin of the parameter U = 0. The trigonometric sense gives the positive orientation for the parameter U. When you create a CylindricalSurface the U and V directions of parametrization are such that at each point of the surface the normal is oriented towards the "outside region". The methods UReverse VReverse change the orientation of the surface. A3 defines the local coordinate system of the cylindrical surface. The "ZDirection" of A3 defines the direction of the surface's axis of symmetry. At the creation the parametrization of the surface is defined such that the normal Vector (N = D1U ^ D1V) is oriented towards the "outside region" of the surface. Warnings : It is not forbidden to create a cylindrical surface with Radius = 0.0 Raised if Radius < 0.0. Creates a CylindricalSurface from a non transient Cylinder from package gp. The CylindricalSurface is infinite in the V direction so V1 = Realfirst, V2 = RealLast from package Standard. U1 = 0 and U2 = 2*PI. Returns the coefficients of the implicit equation of the quadric in the absolute cartesian coordinate system : These coefficients are normalized. A1.X**2 + A2.Y**2 + A3.Z**2 + 2. (B1.X.Y + B2.X.Z + B3.Y.Z) + 2. (C1.X + C2.Y + C3.Z) + D = 0.0. Creates a new object which is a copy of this cylinder. returns a non transient cylinder with the same geometric properties as <me>. Computes the point P (U, V) on the surface. P (U, V) = Loc + Radius * (cos (U) * XDir + sin (U) * YDir) + V * ZDir where Loc is the origin of the placement plane (XAxis, YAxis) XDir is the direction of the XAxis and YDir the direction of the YAxis. Computes the current point, the first, the second and the third derivatives in the directions U and V.
Returns a 2d transformation used to find the new parameters of a point on the transformed surface. me->Transformed(T)->Value(U',V') is the same point as me->Value(U,V).Transformed(T) Where U',V' are obtained by transforming U,V with th 2d transformation returned by me->ParametricTransformation(T) This methods returns a scale centered on the U axis with T.ScaleFactor. Returns the radius of this cylinder. Set <me> so that <me> has the same geometric properties as C.
Changes the radius of the cylinder. Raised if R < 0.0. Applies the transformation T to this cylinder. The UIso curve is a Line. The location point of this line is on the placement plane (XAxis, YAxis) of the surface. This line is parallel to the axis of symmetry of the surface. The VIso curve is a circle. The start point of this circle (U = 0) is defined with the "XAxis" of the surface. The center of the circle is on the symmetry axis. Return the parameter on the Vreversed surface for the point of parameter V on <me>. Return -V.